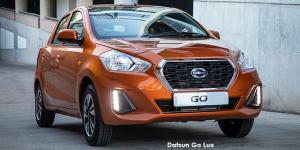 The New Datsun Go is the car that was made to reflect your bold style and unbound energy, with a modern design flair as distinctive as you are. Drive your passion and future forward in a Datsun GO. Buying your first car no longer has to be just affordable – but fun! It doesn’t have to break the bank – but break boundaries. Buying your first new car – is all about finding the balance between practicality and personality. 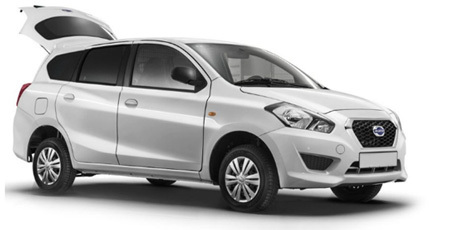 With the Datsun ‘All-In-One-GO’ Plan, you get a New Datsun Go and so, so, so much more! Created to be a compact and sleek, this city car made for the concrete jungle. The Datsun GO is a light and economical hatch that stands out from the crowd, with its distinctive grille to its modern rear lights. 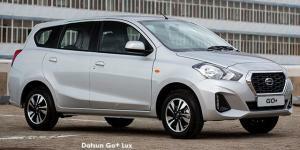 The Datsun Go is no miniature minicar but packs an impressive amount of interior space for driver and passengers. This includes ample boot space that can be adapted for almost any leisure or business venture. The interior of the Datsun Go will make any journey comfortable with its modern console, practical trim and minimalist information cluster on the dashboard – means you have everything you need with no obstructions. You spend so much time in your car that you want it to be an enjoyable and fun experience, no matter where you go – so the Datsun Go is packed with features to hook up your phone or AUX device with nifty USB charging, to pump your own tunes using the mobile docking station. Giving you easy access to all your apps, music and maps plus hands-free calling – all at your fingertips. A driver-side airbag that automatically deploys on serious impact, protecting the occupant, especially during head-on collisions. Crumple Zones allow for the smart distribution of energy and force, reducing injury on impact. Smart ‘Follow Me Home’ headlights that light your path up to 2mins, lighting your way into your home or business safely. Intelligent wiper systems that automatically adjust their speed according to your speed, to keep you focused on driving – rather than adjusting your wiper speed as the weather changes. The best in its class headlamps are more than just stylish, they have a wider and longer visibility beam than its competitors in its class. On the dashboard smart computer that measures and projects important trip information, to help you get the most out of your Datsun Go. Designed to adapt to your lifestyle – the Datsun Go and Go+ is an affordable new car that gets you on the road to drive your independence and future – to go wherever you want to go. Push its impressive acceleration and even more astounding fuel efficiency into high-gear – and start living the life you’ve been dreaming about. Go wherever the road takes you! Love what you see? Contact us today to chat about your business or personal vehicle needs and let our highly-trained sales staff at William Simpson assist you. Looking for more great cars? Visit Our Nissan Brand Here.